It is no surprise that both commercial and central banks hate gold. Because gold reveals the total mismanagement of the economy and the deceitful actions that the bankers take. Once the paper gold market collapses, which is not far away, we will see the full extent of these malpractices which could easily be classified as fraudulent. It is not just central banks that print money. Commercial banks print many times more by leveraging their balance sheets up to 50 times, like Deutsche bank. If you include derivatives this leverage is exponentially greater for all banks. This money printing has totally destroyed the value of paper money in the last 100 years. The following graph confirms what Voltaire said in 1729: Paper money eventually returns to its intrinsic value – Zero. 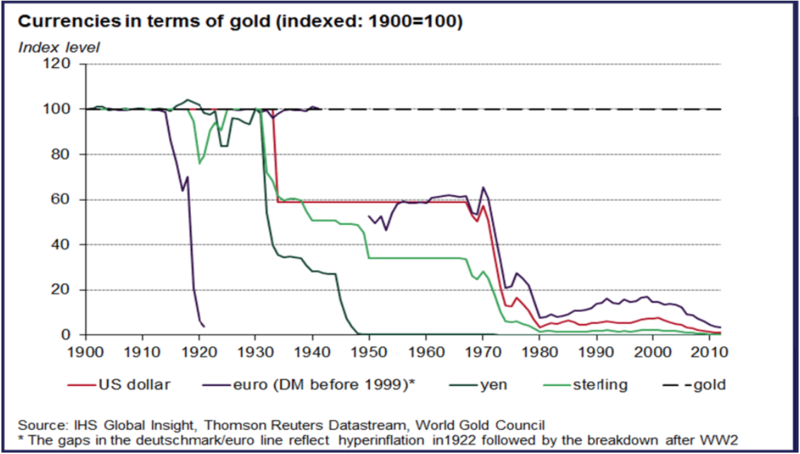 As the chart shows, all major currencies have lost 97-99% against gold since 1913 so they have only 1-3% to go to become totally worthless and that will happen in the next 5 years or so. But we must remember that the 1-3% additional fall is 100% from here. This will be devastating for the world and the main beneficiary will be gold and also silver. We are now in the acceleration phase of this race to the bottom of all currencies. The world saw major asset bubbles in stocks and property in the late 1980s which led to the 1987 crash in stocks and the property crash of the early 1990s. The master of gobbledygook Greenspan then started his trickery in 1990 and lowered short term rates from 8% to 0% in 2008 (aided by helicopter Ben at the end), creating another bubble in stocks. At the same time the biggest and fastest credit expansion in world history started. Global credit increased from $20 trillion in 1990 to around $230 trillion today. But that is just the beginning because the world will soon embark upon the biggest monetary expansion in history which will lead to printing presses and computers turning glowing hot. In a final and futile attempt to save the world’s financial system, governments will embark on a QE programme in the 100s of trillion and probably quadrillions of dollars. The ensuing hyperinflation will end in a deflationary implosion of all the bubble assets including stocks, bonds and property. This extraordinary money printing that will destroy the world economy for a very long time to come has not been possible without leaving some corroborating evidence. In spite of manipulation and intervention in the gold market, gold has still been the best performing asset by a big margin in this century. Gold has outperformed all currencies since 2000. Just look at the chart below. The US$ is down 80% against gold in the last 16 years. The pound is down 82% in gold terms since 2000 and just this year, gold has gained 43% against a collapsing pound. Some badly managed economies have done even worse. The Argentinian Peso is down 99% in 16 years, the South African Rand down 92% and the Ruble 91%. Since governments are doing what they can to hide the mismanagement of the economy, very few people realise the total devastation of the value of paper money. Also most banks don’t understand gold. Since they can’t churn commission on physical gold, they are not interested in offering it to clients. Instead they are flogging stocks and funds on which they earn high commissions. And no bank will ever tell their client that in real terms, stocks are doing very badly. Since the Dow is up 57% in nominal terms since 2000, very few investors realise that they have lost money in real terms. Measured in real terms like gold, stocks have had a terrible century with the Dow down a massive 68% since 2000 against gold. It is the same with all stock indices around the world. They are all down 60-85% already against gold and are on their way to an additional 70-95 % fall in the next 5-7 years. This is hard for most investors to fathom but it is the inevitable consequence of the most massive asset bubble in history. As I expected, Brexit has become the catalyst that will trigger the fall of the world economy and the financial system. The EU elite is now desperate to stop the collapse of their monolithic bureaucracy based on the desire to rule Europe through their megalomaniac structures. They want to punish the UK and have declared that there will be no deal and no concessions. The problem they have is that the rest of the EU has much greater exports to the UK than the other way around. So whatever these unaccountable EU politicians say, there are a great number of people and companies in Europe dependent on exports to the UK and they are not going to let the elite stop them by creating unacceptable obstacles. But the biggest problem for the EU and the ECB is the European banking system which is on the road to perdition. In the period 2000 – 2016 the European banks have lost most of their value and it will be virtually impossible to avoid bankruptcy. 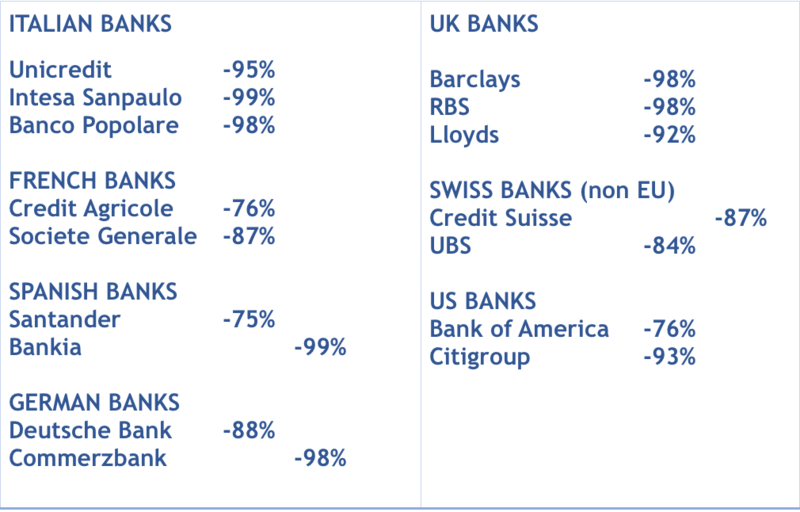 The above major 16 European and US banks have all lost between 75% and 99% of their value in the last 16 years. Anyone who has funds deposited with these banks should be really concerned because share price falls of these magnitudes can only have one outcome – BANKRUPTCY! The inevitable failure of these banks might be deferred for a brief period with the unlimited money printing that will hit the world. But to add more debt will just add to the world’s problems and will not the save the financial system. And since they are the biggest banks in these countries, no one should be under the illusion that other banks will survive. The whole financial system is totally interconnected and there is no bank which is exempt from what it likely to hit the financial system in the next few years. A $10,000 investment in Citigroup would today be worth $3,000. On the other hand, $10,000 invested into physical gold would today be worth $48,000. If we go 4-7 years forward, the Citigroup investment will probably be worthless whilst gold is likely to be at least 10 times higher and probably much more with hyperinflation. For investors who are not protected against the inevitable course of events as outlined above, there is still a final chance today but that window of opportunity will soon disappear. Physical gold and silver represents superb insurance in a world of unprecedented risk. Tagged European Banking system, fiat money, world's reserve currency.